The term sauna originated in Finland which literally means “bathhouse”. Aside from its relaxation purposes, saunas are also considered as a form of socialization by most people. Saunas can be found in places like the spas, gyms, and healing centers. Some even have their own saunas at home. There are various types of saunas that you can choose from. They all vary depending on their heating systems, and they come in different sizes and shapes. One type of sauna is the home or indoor sauna. Home saunas are beneficial for you and your health. Not to mention that having the best home sauna is also a good investment for your home. Aside from the fact that home saunas are great for your body, it also has extensive benefits for your health. Almost all sauna users attest that using sauna reduces their stress. Medical studies state that stress has a negative impact on your health. In fact, the majority of diseases are partially stress-related. The heat that comes from the sauna improves blood circulation, relaxes the muscles, and stimulates the body to release endorphins. According to a medical study in Finland that involves Finnish men; frequent use of saunas may help you live longer – for men, at least. The research was conducted for 20 years by following middle-aged men. The unequivocal result shows that the more frequent men go to sauna and the longer they stayed, the lower the risk of developing cardiovascular diseases. The heat that comes from sauna releases endorphins which are essential in minimizing muscle soreness, especially after an intense workout. Also, the heat can cause dilation of the blood vessels and increases the blood circulation. Increased blood circulation helps speed up the healing process of minor cuts and bruises. The sauna heat relaxes the muscles by reducing muscle tension. Lead, mercury, cadmium, and arsenic are toxins that are commonly absorbed from the environment. According to a study, these toxins can be released from the body by deep sweating. The heat coming from the sauna stimulates the sweat glands to produce sweat, thus eliminating the toxins out of your body. A sudden exchange in body temperature (cool to hot or hot to cool) increases your heart rate. The heat effect of sauna causes a significant increase in the cardiac output that boosts blood circulation. This strengthens the heart muscles and reduces the chance of developing heart disease. Spending time in a sauna opens your skin pores. The heat from the sauna causes deep sweating and removes bacteria from your skin. Deep sweating removes dead skin cells and makes your skin look vibrant. It cleanses the skin pores, and it helps in capillary circulation. Regular use of sauna burns body calories and increases metabolic rate. The heat increases heart activity, lowers blood pressure, and increases oxygen demand. These effects are similar to cardio exercise. The body will then convert the calories into usable energy and promote weight loss. It is believed that sauna heat can actually burn 600 body calories in 30 minutes. The weight loss for sauna users are merely water weight, and it can come back quickly. A study shows that exposure to sauna heat increases levels of norepinephrine (sharpens your focus), prolactin (nerve damage repair), and dynorphins (feel-good sensitivity). It also increases BDNF (brain-derived neurotrophic factor), which is essential in the growth of new brain cells and improves brain function. Finland’s observational research shows that exposure to sauna heat reduces the risk of developing Alzheimer’s disease and other dementia. The heat and steam of sauna reduce incidents of influenza and colds. Its steam vapor clears up sinus congestion. Sauna goers agree that the warmth of sauna is good for the body and soul. It serves as a pampering treat that makes you feel better, looks better, and sleep better. A variety of sauna products are widely available in the market. We have conducted home sauna reviews of different sauna products. This will serve as your guide in deciding which home sauna is best for you. Enjoy this sauna right in the comfort of your own home. 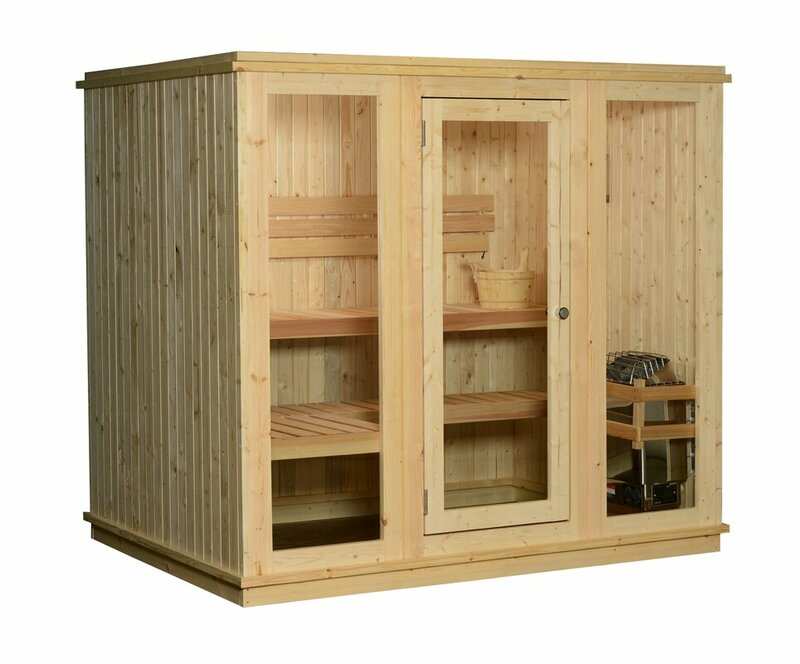 This 2-person sauna is 100% made from FSC Certified Canadian hemlock wood. It has infrared heating panels that can be placed in any indoor location like the basement, walk-in closet, and master bath. It is fairly affordable as compared to other bigger home saunas. Its elegance and spacious design can fit into an average home. The heating panels of this product are situated in the calf areas, back, and sides to maximize the heat in the area. You don’t have to worry about heat expansion and insulation since this sauna fits compact spaces. This product has a built-in digital panel that lets you control the duration and temperature of the best home infrared sauna. It is the largest indoor sauna offered by Almost Heaven Saunas. 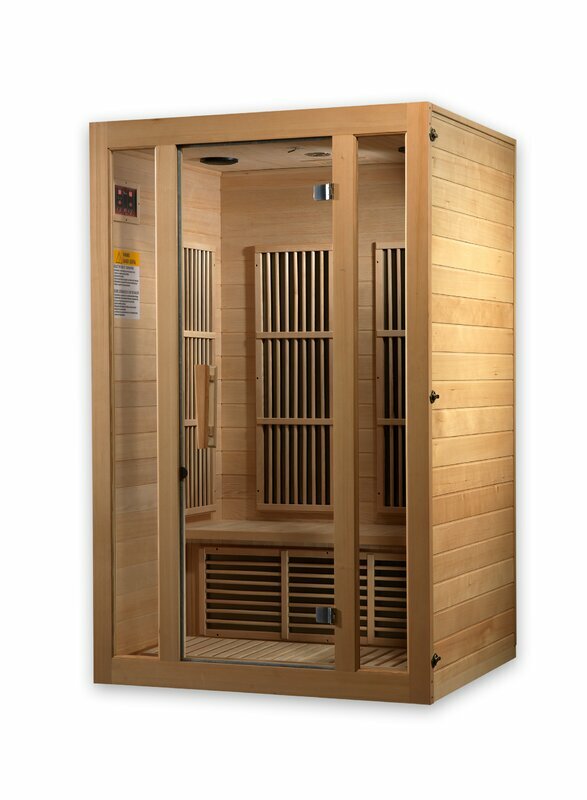 This traditional steam sauna is a free-standing sauna and can utilize existing floor. It is constructed from thick sections of light-colored hemlock and fir softwoods and western cedar. Its precise fit makes it easy to assemble. It can accommodate up to 6 bathers, and its interior LED lighting is perfect for relaxation. This product comes with a wall-mounted heater, a bucket and ladle set, sauna stones, and a thermometer. The two lower bench is used for sitting while the upper bench is for lying down. This is ideal for dry sauna or wet sauna. Revitalize yourself with this portable infrared sauna. It is lightweight, portable, and can be folded easily, which is ideal for easy storage and for traveling. It has auto shut-off feature and uses far infrared heating emitters. The material is made from satin polyester and is moisture resistant. It includes a foldable chair, insulated floor mat, remote timer and temperature control. It has a built-in thermostat and five pre-heat temperature levels. It contains one heating panel. This sauna emits EMF (electromagnetic fields) minimally and uses little electricity. You can fold it up for easy storage in the closet or under your bed. It is portable that you get to enjoy a sauna experience anytime, anywhere. It features three heater panels that are made of tourmaline that emits negative ions and infrared waves. This sauna is spacious enough that it can accommodate anyone, whether small or large. It is sturdy and delivers heat fast. It includes a remote control to manage temperature. It generates heat in a small period of time. 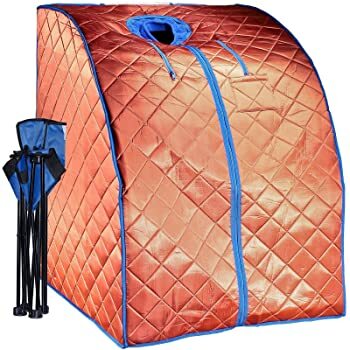 This portable steam sauna is a space saver sauna. It delivers the same benefits of a regular sauna at an affordable price. 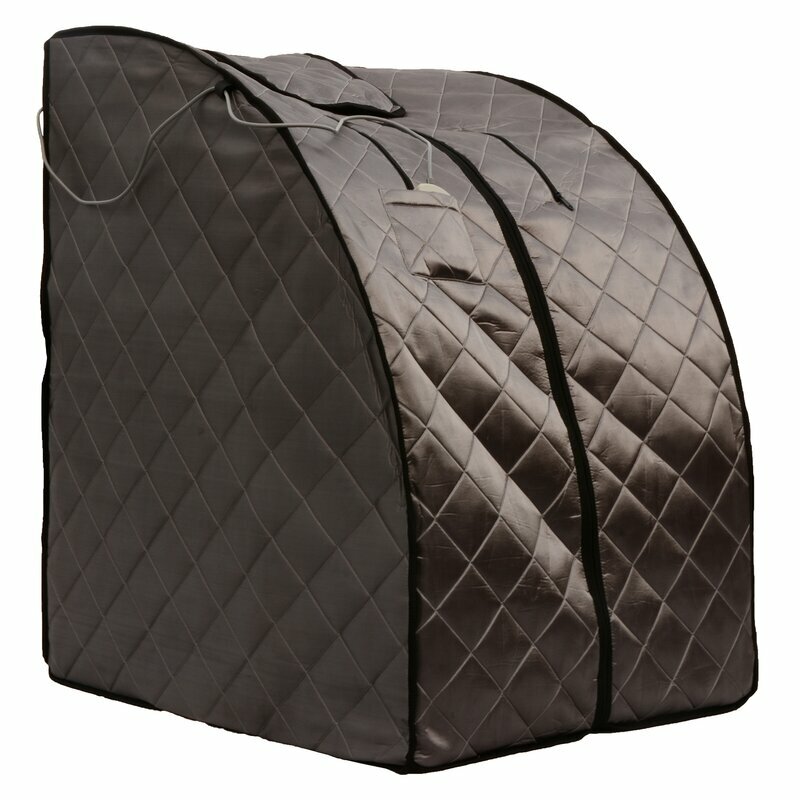 Its sauna technology is compressed in this lightweight sauna that you can move anywhere. This can be assembled easily and is ready for use within minutes. 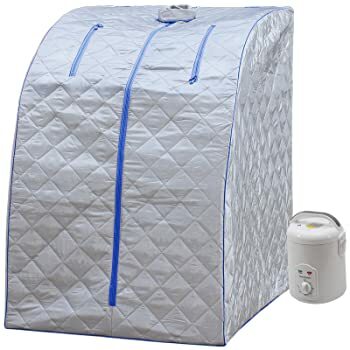 This best home steam sauna comes with a steam condenser, a steam hose, and a tent. The steam hose can be directed towards or away from the body. It is a space saver sauna with an attractive price. This portable sauna is simple to use. You just have to add water or essential oils to get the maximum benefit from the sauna. A home sauna is an enclosed room designed for heat sessions. The heat produced in the room causes a person to sweat, which is found to be beneficial to the health. The exceptional heat of a home sauna produces either wet heat or dry heat. How can you differentiate a wet sauna and dry sauna? Most saunas make use of a heater and volcanic rocks. The rocks are heated at a high temperature. For wet sauna, the heated rocks are splashed with water to create a moist and form a steam. On the other hand, the rocks for dry sauna doesn’t make use of water, they are just heated. The mere difference between the two is the presence of humidity. What is the difference between an infrared sauna and traditional sauna? The difference between a traditional sauna and infrared sauna depends on the heat and humidity. The traditional sauna uses heat with the temperature of 185°F to 195°F. It also uses water to generate steam and creates a humid experience. On the other hand, the infrared sauna uses a milder temperature that ranges between 120°F to 150°F. The heat is penetrated into the body through infrared rays. Where can I place my home sauna? The home sauna can be placed on any surface – tiles, concrete, laminate, any surface that does not absorbs water. Also, it is not advisable to place it on a carpet as it absorbs odors and sweats. How much will a home sauna cost? The cost of a home sauna depends on the sizes, the quality, and the included accessories. Should I be concerned about any health problems? In case of any history of high blood pressure, heart disease, and the like, you should first consult your physician before a sauna bath. Infrared has been used already in medical practices. Infrared saunas use light energy that is beneficial to the body and does not cause harm. Are home saunas safe for children? Saunas can be used by children aged 12 years and above. Children below this age are not yet capable of thermoregulating. When is infrared sauna not recommended? The use of infrared sauna is not recommended for pregnant women, children below 12 years old, those who are under the influence of alcohol, and those who can’t handle the extreme temperature. Almost all the products mentioned above gives the wonderful benefits of having an indoor sauna in your own home. 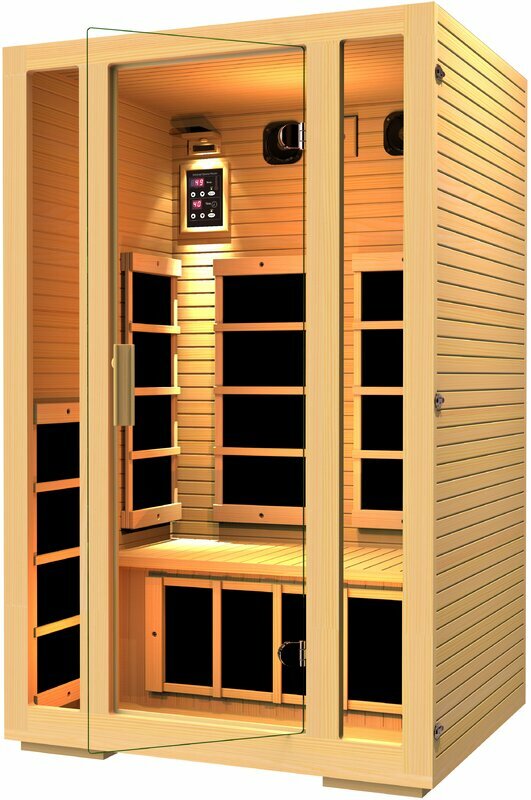 But after the entire product reviews, by far, the best home sauna is JNH Lifestyles Joyous 2-Person FAR Infrared Sauna. If you are looking for an infrared setup that uses quality materials and has great features, then this should be your top pick. It has built-in control options that allow you to control the timer and the temperature. Compared with other home saunas, this product is worthy of the price. It has built-in quality speakers and AUX input that you can connect either from your MP3 device or smartphone. You can listen to your favorite music that can also set your mood. This product is even easy to assemble. So, if you’re considering having your own FAR infrared unit in your home, the Joyous 2-Person FAR Infrared Sauna is your top choice. You won’t find other home saunas similar to this product that is constructed with high-quality materials. And remember, always purchase products from a reputable company to ensure the quality of product you will get.